They are the grey eminences of aviation. They are doing what they have to do without any ado. We hardly notice them when we take a flight from A to B. However, cargo aircraft can be as interesting and special as fighter planes or passenger aircraft. We are going to prove this. We compared the following amazing transport aircraft by these means: Name - Country - Primary use - First flight - Powerplant - Empty weight - Payload - Specialty/fun fact. USS Macon (ZRS-5) – United States – rigid airship, flying aircraft carrier (launched biplane fighters from its exterior riggings) – 1933 – 8 × 420 kW (560 hp) internal combustion engines – 108,000 kg – 72,000 kg – The USS Macon and the USS Akron (ZRS-4) were among the largest flying objects ever built. Martin JRM Mars – United States – cargo transport seaplane – 1942 – 4 × Wright R-3350-24WA Duplex Cyclone 18-cylinder radial engines – 34,279 kg – 15,000 kg – It was the largest Allied flying boat, although only seven were built. Messerschmitt Me 323 Gigant – Germany – heavy military transport – 1942 - 6 × Gnome-Rhône 14N-48/49 two-row air-cooled radial engines – 27,330 kg – 12,000 kg. It was the largest land-based transport aircraft of the 2nd world war. The Hughes H-4 Hercules (also known as the "Spruce Goose") – United States – heavy transport aircraft prototype (1 built) – 1947 – 8 × Pratt & Whitney R-4360 Wasp Major radial engines – loaded weight: 180,000 kg – This is the largest flying boat ever built and it has the largest wingspan of any aircraft in history. Mil Mi-6 – Soviet Union – heavy transport helicopter – 1957 – 2 × Soloviev D-25V turboshaft – 27,240 kg – 12,000 kg – The Mi-6 was the world's largest and fastest helicopter when it was introduced. Antonov An-12 – Soviet Union – civil and military transport aircraft – 1957 – 4 × Progress AI-20L or AI-20M turboprops – 28,000 kg – 20,000 kg – Over 900 had been built, in both military and civilian versions. Canadair CL-44 – Canada – turboprop airliner and cargo aircraft – 1959 – 4 × Rolls-Royce Tyne 515/50 turboprops – 40,348 kg – 29,959 kg – Innovative fuselage design. Armstrong Whitworth AW.660 Argosy – Great-Britain – military transport/cargo aircraft – 1959 – 4 × Rolls-Royce Dart RDa.8 Mk 101 turboprops – 25,401 kg – 13,150 kg – Its unusual "pod and boom" structure earned its nickname "The Whistling Wheelbarrow." Image source: Flieger-Jahrbuch, 1965. Transpress Veb Verlag Für Verkehrswesen Berlin, 1964. Mil Mi-10 – Soviet Union – heavy military transport aircraft – 1960 – 2 × Soloviev D-25V turboshaft – 27,100 kg – 3,000 kg internally or up to 15,000 kg payload on platform or 8,000 kg max slung payload – A transport helicopter of flying crane configuration. Aero Spacelines B-377PG Pregnant Guppy – United States – wide-bodied cargo aircraft – 1962 – 4 × Pratt & Whitney R-4360-59 "Wasp Major" radials – 41,275 kg – 22,670 kg – This aircraft was built to transport outsized cargo for NASA's Apollo program, primarily portions of the Saturn 5 rockets. Sikorsky CH-54 Tarhe – United States – heavy-lift cargo helicopter – 1962 – 2 × Pratt & Whitney T73-P-700 turboshaft engines – 8,980 kg – 9,072 kg – A highly successful aerial crane used in Vietnam for transport and downed-aircraft retrieval. Antonov An-22 – Soviet Union – heavy military transport aircraft – 1965 – 4 × Kuznetsov NK-12MA turboprops driving contra-rotating propellers – 114,000 kg – 80,000 kg – The world's largest turboprop-powered airplane. Mil V-12 – Soviet Union – heavy lift helicopter – 1968 – 4 × Soloviev D-25VF turboshaft engines – 69,100 kg – 40,000 kg – The largest helicopter ever flown, although only two prototypes were built of this transverse rotor system aircraft. Lockheed C-5 Galaxy – United States – USAF strategic airlifter – 1968 – 4 × General Electric TF39-GE-1C high-bypass turbofan – 172,370 kg – 122,470 kg – One of the largest military aircraft in the world used to move vehicles and equipment. Image source: Repülés, August 1969. Ilyushin Il-76 - Soviet Union - multi-purpose strategic airlifter, commercial freighter - 1971 - 4 × Aviadvigatel PS-90-76 turbofans - 92,500 kg - 60,000 kg - It has also been modified into an airborne refueller, waterbomber, and simulated weightlessness trainer for cosmonauts. A-90 Orlyonok – Soviet Union – ekranoplan (a ground effect vehicle) – 1972 – 2 × Kuznetsov NK-8-4K turbofan, 1 × Kuznetsov NK-12MK turboprop – N/A – 28,000 kg – The A-90 uses ground effect to fly a few meters above the surface. It is a Class B Ekranoplan, it can achieve an altitude of 3,000 m.
Mil Mi-26 – Soviet Union – heavy transport helicopter – 1977 – 2 × Lotarev D-136 turboshafts – 28,200 kg – 24,000 kg – The largest and most powerful production helicopter. 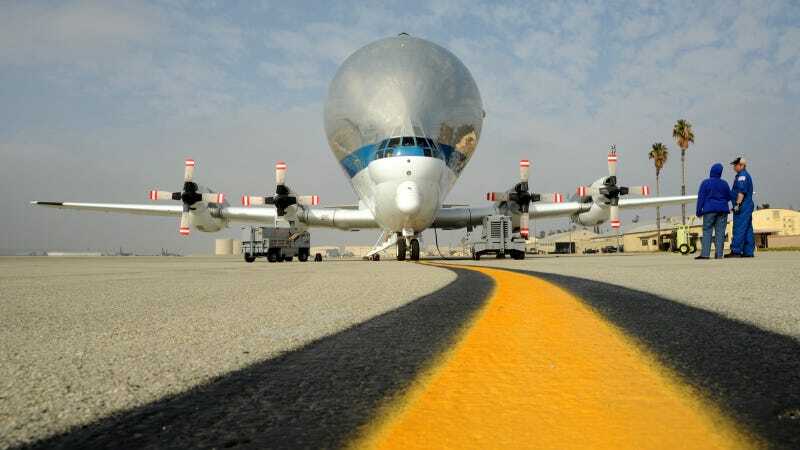 Boeing 747-100 Shuttle Carrier Aircraft – United States – two modified airliners NASA used to transport Space Shuttles – 1977 – 4 × P&W JT9D-7J turbofans – 144,200 kg – 68,585 kg – Piggybacking Space Shuttle orbiters. Myasishchev VM-T Atlant – Soviet Union – strategic airlift airplane – 1981 – 4 × RKBM/Koliesov VD-7MD turbojets – 75,740 kg – 50,000 kg. The VM-T was designed to carry rocket boosters and the Soviet space shuttles of the Buran program. Antonov An-124 Ruslan – Soviet Union – strategic airlift jet aircraft – 1982 – 4 × Ivchenko Progress D-18T turbofans – 175,000 kg – 150,000 kg – The world's largest military aircraft. Antonov An-225 Mriya – Soviet Union – strategic airlift cargo aircraft – 1988 – 6 × ZMKB Progress D-18 turbofans – 285,000 kg – 253,820 kg – The largest and heaviest airplane in the world, carrier of the the Soviet space shuttle Buran. Boeing C-17 Globemaster III – United States – strategic/tactical airlifter – 1991 – 4 × Pratt & Whitney F117-PW-100 turbofans – 128,100 kg – 77,519 kg – The C-17 is used to transport the Presidential Limousine and security detachments. Antonov An-70 – Ukraine – medium-range transport aircraft - 1994 – 4 × Progress D-27 propfans – 66,230 kg – 47,000 kg – The first large aircraft to be powered by propfan engines. Airbus Beluga – France (and Germany, the United Kingdom and Spain) – wide-bodied outsize cargo freight aircraft – 1994 – 2 x GE CF6-80C2A8 high-bypass turbofans – 86,000 kg – 47,000 kg – It is basically an Airbus A300-600 airliner modified to carry aircraft parts and oversized cargo, and well, it really looks like a Beluga. Boeing 747 Large Cargo Freighter (LCF) or Dreamlifter – United States – wide-body cargo aircraft – 2006	– 4 x Pratt & Whitney 4062747 high-bypass turbofans – 180,530 kg – N/A – Used exclusively for transporting 787 aircraft parts to Boeing's assembly plants from suppliers around the world. Able to land and takeoff from Col. James Jabara Airport, Wichita, Kansas. Boeing 747-8F – United States – wide-body freighter aircraft – 2010 – 4 x GEnx-2B67 high-bypass turbofans – 195,800 kg – 140,000 kg – The second largest cargo jet after the Mrya.